Last month I was very interested to find crimson popping corn on the cob at Pitchfork and Crow. I bought two ears out of curiosity, and Jeff was good enough to throw in a few less decorative ears for popping experimentation, suggesting I give them a little more drying time first. 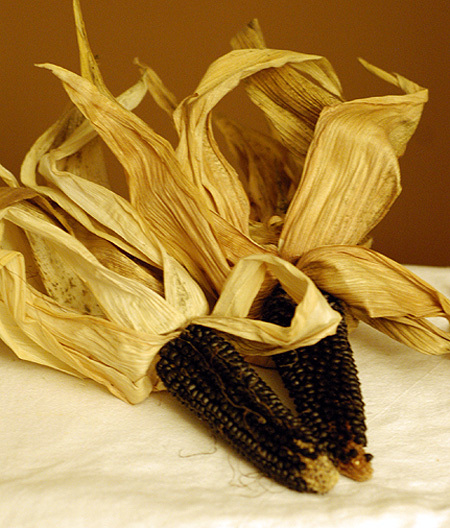 So they graced our table as harvest decorations for a few weeks alongside pumpkins and squash, and two nights ago I sat down and shucked the kernels off a few cobs. Now, popcorn is not a snack we eat all that often. I recall that growing up, we had an air popper in the house, but it didn’t see much action. As with most folks these days, the majority of my popcorn came in microwaveable packets, filling the air overwhelmingly with either artificial butter aromas or acrid smoke. So I was a little nervous about the proposition of popping corn on the stovetop for the first time. I followed the instructions at Simply Recipes, heating the oil in my large saucepan with a few indicator kernels. Peering through the glass lid skeptically, I was just starting to think that the kernels were just going to burn away when presto, they popped into perfect little puffs. At this point, I pulled the pan off the heat, added the remaining kernels, and counted to 30 before returning them to the burner, and within 2 minutes, I had a bowlful of perfectly popped corn. Nothing burned, and I found exactly one unpopped kernel, so this was incredibly effective! 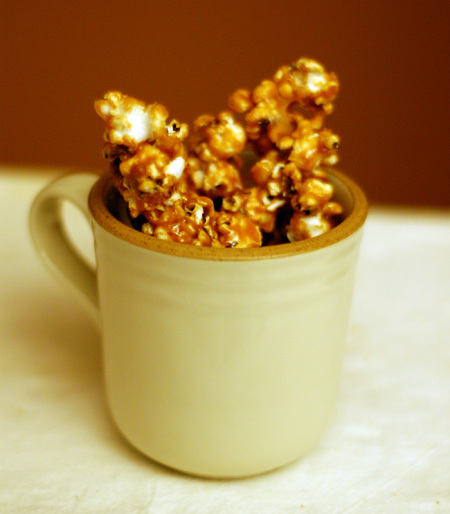 I made this popcorn as an after-dinner treat for us, a quick sort of dessert to tide us over until the Thanksgiving pies are ready, so I decided to make a sort of caramel corn. Oddly enough, caramel corn will always remind me of the old Stapleton Airport in Colorado—the terminal was perpetually scented with it. My variation was actually a peanut butter caramel, made with just four ingredients: sugar, honey, peanut butter, and vanilla. It made a decadently soft, sweet, barely salty coating for the popcorn, and would probably be a yummy dip for apple slices also. Prepare an oversized mixing bowl. Place a large heavy pan with a lid over medium high heat, film the bottom with vegetable oil, and add three kernels of popcorn. 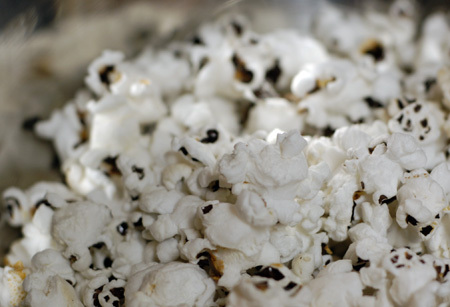 When they pop, remove the pan from the heat, add the remaining popcorn kernels, and count to 30. Return to the heat covered (keep the lid barely cracked), and shake the pan vigorously as the kernels start popping, which should happen fairly quickly. When the popping slows, take the pan off the heat, and pour the popcorn into the bowl to cool, removing any unpopped kernels. Lightly season popcorn with salt to taste. Wipe out the same pan, and return to the heat. Dump in the honey and sugar and bring to a boil; allow to simmer for a couple minutes, then remove from the heat and add the peanut butter. Stir vigorously until all the peanut butter is melted, then mix in the vanilla. Immediately pour the peanut butter caramel over the popcorn and stir with a long-handled wooden spoon until it’s all coated (grease the spoon if you don’t want popcorn sticking to it). Once it’s mixed you can put it in a serving bowl, or spread on a silpat to set up a little more firmly. Source: Slightly adapted from TheKitchn. Update 2/6/11: My husband loves this popcorn and requests it frequently. The recipe can also be made using other nut butters; I was out of peanut butter and substituted homemade almond butter to no detriment. It made a great Superbowl snack! Update 5/27/12: Found some organic blue popcorn at Tony’s Market and had a hankering for this popcorn. Nolan is loving it, and it is gluten-free/casein-free without any alterations! In the fall, I’ll have to test-drive the recipe with sunbutter to make it nut-free for school snack-time as well. I’ve never seen those dark corn kernel before. Peanut butter popcorn sounds really creative and delicious. That popcorn looks like such a treat! I love pb anything…. 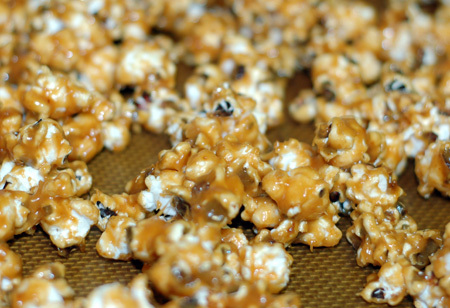 What a great idea to incorporate peanut butter with popcorn! Two of my favorite things to eat! Hope you have a Happy Thanksgiving today. Oh Yum! Popcorn with peanut butter what a fantastic idea. I would like to present you with the “One Lovely Blog “Award. Please drop by my site to pick it up when ever you are free.